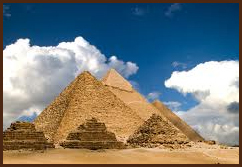 Of all the monuments of ancient Egypt,The Pyramids of Giza are the most famous. Built around 4500 years ago, it was the belief of ancient Egyptians that death was the start of a new journey to thenext world. The embalmed body of Pharaohs and their queens, were entombed within the pyramids in order to protect them, and allow them to ascend into their afterlife – a place among the Gods. The largest pyramid, called The Great Pyramid, is one of three situated in Giza and is believed to have been built as a tomb for the Pharaoh Khufu (Cheops). 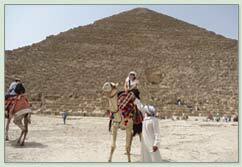 This pyramid is the only remaining member of the Seven Wonders of the Ancient World. An interesting fact is that the temperature inside The Great Pyramid remains constant at 68 degrees F, the same as earth’s internal temperature. The other of the three Pyramids are the Pyramid of Khafre (Chephren) which is slightly smaller than the Great pyramid, and the Pyramid of Menkaure (Mycerinus), the smallest of the Giza pyramids. The Great Sphinx of Giza is constructed from limestone, and is a mythical creature with a lion’s body and a human head. It is the largest monolith statue in the world, and is the largest surviving sculpture from the ancient world. 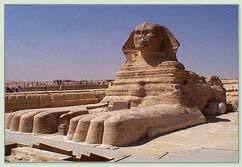 The original purpose of the Sphinx is still unknown.